There’s a scene in John Carpenter’s The Thing when Kurt Russell and the rest of crew at an Antarctic research station realize that their sled dogs have been melted by an alien and blobbed together into one hideous creature that is the stuff of nightmares. Like a lot of the movie, it’s disturbing to say the least. There’s something about the the design of the blob-dog-alien creature that just rings as…wrong. Eyes are where they shouldn’t be, jaws open up from weird crevices, and melted organic all make for something that looks like it came straight out of Hell. It sounds awful (which it is), but that’s also what makes the movie great and, coincidentally, is what makes Astonishing X-Men 8 enjoyable as well. Today, Drew and Patrick are discussing E is for Extinction 4, originally released September 30th, 2015. This issue is a Secret Wars tie-in. For more Secret Wars coverage from the week, check out our Secret Wars Round-Up! Today, Taylor and Michael are discussing Uncanny X-Men 32, originally released March 25th, 2015. 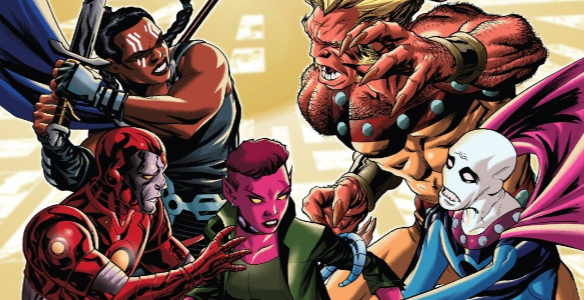 Today, Drew and Michael are discussing Uncanny X-Men 30, originally released January 28th, 2015. I don’t know why she swallowed a fly — Perhaps she’ll die!